This still works 04/03/2016. Nice! Good work, nice and clean, Gongju ! 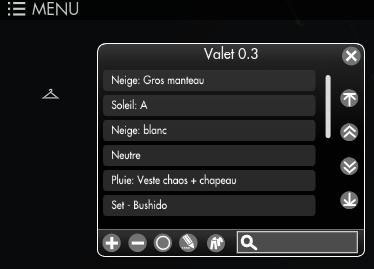 Valet was broken by the episode 9 update (june 2014). Also, for any problem on the mod, it's better to use the secret world forum topic. I read it more often than the comments here, and you're also more likely to get help from other users. Valet is having issues for me, as well. It is not chaging outfits if I am wearing a uniform. Some pieces are not changing and others are changing but saying that they cannot be found. Confirmed. Since AEGIS was added it seems that it will still load some saved outfits, but cannot create new outfits. New outfits save, but won't load. Verifying what Samarith said. Valet is shooting off error messages left and right. It seems like it isn't removing clothing items anymore, only switching them, if applicable. No matter if it finds the item or not, it always tosses out an error message that it hasn't. The new AEGIS system seems to have messed with the slot numbering. Valet can no longer find a lot of the clothing items for me. Can you direct me to the location of the actual files for the purposes of backing up and restoring? I recently had my computer crash and attempted to restore from a backup, but somehow none of the saved outfits on all my characters made it in. it works perfectly ! Thanks for this good work ! TSW recently added an accessory slot for earrings and ear pieces. This is causing error codes. Is there any chance for an update? Oh please!!! Thank you. I love this addon! Thank you for reporting this bug. The new version (0.3.1) should fix this. I have a weird problem where Curse keeps telling me there is an update. I update it, and it seems updated, and a little while later, it thinks it needs an update again. I wanted to try uninstalling the mod and re-installing it, to see if that would fix the issue. I don't want to lose all my outfits, however. Where are the saved outfits stored? Well, I tried uninstalling and re-installing through curse, and it still keeps telling me I need to update it, and I update it, and it shows as updated for awhile, and then some time later, it thinks it needs to update itself again. This mod isn't working for me at all. The icon shows up, opens settings, lets me save outfits (No clue if it is actually saving the outfit or just creating a label for the outfit without saving anything), etc. However the button to load the outfit just does nothing, so basically the mod does nothing. Try double-clicking on the outfit name to see if it still doesn't work. It will help me know if the problem is with the button or with the code used later in the addon. Just in case, if your current equipped outfit is the same than the one you try to load, of course the addon will not do much. Firstly, Valet now correctly integrates into the latest version of Viper's Topbar Information Overload. YAY! This is the first time (for me) that it has done that. Secondly, the buttons stacked along the right side do absolutely *nothing. * They neither sort the list nor move the cursor up or down (which would be pretty useless anyway since we all have scroll wheels on our mice). Is there some way to make the addon sort the list? For the Topbar Information, I have no idea why it works only now for you. Once the feature shipped, I never had any problems. The purpose of the buttons on the right is to move the *selected* outfit in the list. The buttons are disabled if no outfit is selected or if the action associated with the button makes no sense with the current selection (ie: to move up the outfit already at top of the list), or if there is some text in the filter field. Maybe you encounter a bug with the enabling/disabling of the buttons. I will have to look at it. (I did not have much time to play lately). Love the mod, can't make it appear in Viper's top bar. All of my other mods do, and Valet did up until a week ago. Is there a toggle somewhere to make it appear in the top bar? Right now I have to find it in the add-on manager. I was unable to reproduce your issue, so I can't help you. Excellent! Thank you. Yes, it's much easier to click the button than to double-click the name. Still not appearing in topbar, though. I don't know if this is relevant, but in the early days the mod wouldn't appear in topbar, but if I went into slot settings and changed the width it would start working. Now it doesn't. I have six mods integrated into topbar right now. The ones I see are in positions 1, 2, 3 on the left and 5, 6 on the right. So my guess is that Valet is in slot 4, but the icon isn't appearing. (Clicking on the blank space for slot 4 does nothing, unfortunately :) ).